If you’ve been looking for a deck builder with more strategy, awesome source material, and tons of replay value… High Command is it! Warmachine: High Command takes players to the world of Iron Kingdoms. Players will command epic warcasters, warriors and huge steam powered warjacks to wreak havoc against their enemies. High Command is both a deck building game and a deck construction game. Constructing your deck before the game starts is really easy to do, and get’s more fun each time you play. Once the game starts, players will use their resources to buy cards to build up their army, and then send their forces out to locations with the goal of capturing them, or at least stopping other players from doing the same. It’s a balance of maximizing the resources at your disposal, building your army, deciding when to attack and defend… and it’s a ton of fun! Yes, this is a deck building game, but unlike other games where everyone gains cards from a common pool, in High Command each player will have their own faction specific pre-constructed deck that they will build their army deck from throughout the game. The genius of High Command is that deck construction is fun and quick, yet still maintains depth for players looking to dig deeper into its strategies and tactics. 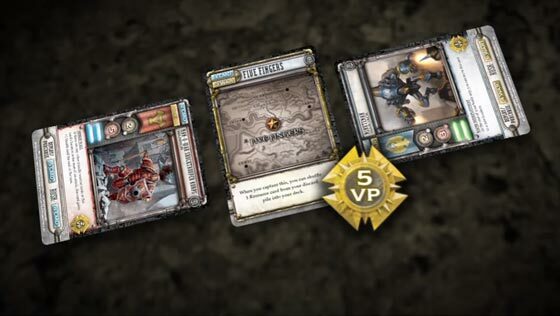 Warmachine: High Command comes with four factions: Cygnar, The Protectorate of Menoth, Khador and Cryx. These factions come from the miniatures game, and if you’re a Warmachine player you’ll be pleased to see that Privateer Press is using the same warcasters, warjacks and other characters. They’ve also done a great job at making the play-style of each faction feel similar to its miniature’s equivalent. Not all of the Warmachine factions are included in the game, but you can expect to see them released in future expansions. Each faction has five warcaster cards from which you’ll choose three. A warcaster is a battle-proven commander and has the ability to greatly shift the battle in your favor. Each warcaster can only be played once per game so choose wisely when to put them into battle. You’ll see that each warcaster, on the middle-left side of the card, has two colored bars called detachment colors. These colors help determine which sets of detachment cards you’ll be able to choose from to construct your reinforcement deck. Each faction has six sets of detachments (12 cards per set). They are differentiated by color: orange, yellow, green, blue, purple and red. You’ll construct your deck by choosing three detachment sets. The process is simple. For each chosen warcaster, take one detachment set that matches one of the two detachment colors on that warcaster’s card. Shuffle these three sets together and you have your reinforcement deck. There is a general theme for each color. Unfortunately, they aren’t explained in the rulebook. The good news is Privateer Press has posted an article on their site that details each color theme and is a must read for anyone looking to dig deeper into the game. Take the top four cards from your reinforcement deck and set those face up in front of you. These four cards make up your “reserves” and are the cards you can purchase or rush during your turn. You’ll also place your three warcasters face up in front of you. Now that you’ve got your warcasters and reinforcement deck set up, you’ll also grab your faction’s basic resource cards. These are the 12 cards that you’ll start every game with. They are easily identifiable (see image below) because they have no colored bars in the middle left of the card. Shuffle them and take six for your starting hand. Simply shuffle the locations and place a number of locations, equal to the number of players, face up in the middle of the table. This deck determines the length of the game. There are five early, mid and late game cards. You’ll shuffle each set of five individually and then stack them; early on top, late on the bottom. Now you’re all set up and ready to go! Each round the first player will draw a winds of war card (there are 15 total). Beyond acting as turn trackers, each card affects the gameplay for that round (ie: making cards cheaper to purchase, being able to draw extra cards on your turn, etc.) Another kicker is that one of the last five cards, called Day of Reckoning, will end the game. Since during setup these last five cards are shuffled, you’ll never know exactly when the game will end! In general, the flow of the game involves using the resources on the cards in your hand to purchase army cards from your reserves that will be put into your discard pile. You’ll draw six cards each turn, so when the draw pile (called the army deck) runs out, you’ll shuffle the discard pile up and draw, but this time the army cards you purchased will be in there as well (typical deck building). Once you start drawing army cards you’ll then have the option to deploy them to the location cards. If there are opposing forces at locations with your cards, you’ll have battles. Then the next player will take their turn. If it comes back to your turn and you have two or more cards than any other player at a specific location, then you’ll capture that location! Play will continue until the winds of war card is drawn called Day of Reckoning. At this point any location where a player has two or more cards than any other opponent will get to capture that location. Then each player will add up the victory points on the cards they acquired and locations they captured throughout the game. The player with the most victory points wins the game! Now that you know how the flow of the game goes, let’s talk about some specifics and what make High Command unique! In the upper-left of each card are two types of resources: Command (CMD) and War (WAR). Each card will have its own amount of CMD, WAR or both. When using a card in your hand for the resource, you simply discard that card and can use either the CMD or WAR, but not both. The army cards you purchase from your reserves are what mix up the gameplay and also give each faction its own unique play-style. 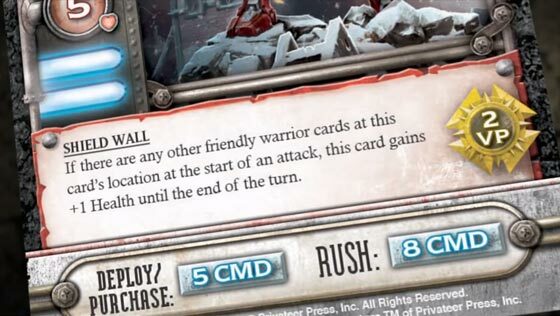 These cards will include support units, warriors and powerful warmachines called warjacks that will help give you the edge when battling against other players. The number in the white circle is the Power (or strength) of the card. The red circle is the Health of the card (how much damage it can take before it’s destroyed). Then at the bottom, most cards will have a special effect that can be used if the conditions are met. When an army card ends up in your hand, you do have the option to simply use it for resources. Pay special attention to army cards that have the victory point icon in the lower right… a game is typically not won or lost purely on how many locations you capture, but also how many cards you acquired that give victory points. If you have an army card in your hand, simply pay its purchase cost to put that card next to a location card on the table. But remember, in order to have an army card end up in your hand, you had to: purchase it, place it in your discard pile, wait for it to be shuffled back into your army deck and then draw it. Wouldn’t it be cool if you could skip that entire process? You can with Rushing! By paying the rush cost of a card in your reserves you are able to place it directly next to a location. In many cases it costs twice as much to rush a card than it does to purchase it, but there are also quite a few cards where it costs the same or just a little more to rush. This is a big way the play-style can differ between factions. After you’ve spent your turn purchasing, deploying and rushing, if you still have cards in your hand you’ll have the option to “bank” one card from your hand that you can add to your hand the next time you draw cards. Any extra cards in your hand after that will be discarded. It seems quite simple, but it’s amazing how important this option can be. You still get to draw six cards, so that banked card will bring your hand to seven. Banking the right card can really help you on your next turn. One really nice part of High Command is that there are no surprises once the battles begin. By that I mean players don’t have “instants” or “action” cards that they can pull out during the battle. This makes High Command much more about strategy than luck. During battles, both sides attack and defend simultaneously (though you do resolve battles one location at a time). Each player involved will add up their total power and health from all their cards, and apply any special effects written on those cards. Then if players have enough power to equal or exceed the Health of one or more of their opponent’s cards, they can destroy those cards. Destroyed cards aren’t removed from the game, they are simply discarded into their owner’s discard pile. At the start of your turn, if you have two more cards than any other player at a location you capture that location. The cards you had at that location are put out of the game in a pile called “occupying forces” (note: you do get to count the victory points on these cards). The location card is put into your discard pile and can be used later in the game when you draw it. Any opponent with cards at that location simply puts those cards into their discard pile. Since the player who did the capturing doesn’t get their forces back, it means they can’t turn right around and put them on another location. This creates a really nice balance throughout the game between the strength of each player’s army deck. If we used a miniatures game as an example… think of getting a huge portion of your army destroyed by your opponent. Normally your chances of winning would greatly diminish because while you lost half your army, your opponent still has all of theirs. Maybe it’s time to shake hands and surrender? Now imagine if your opponent had to also remove their forces that destroyed yours from the game… now things are still fairly even, and you have a much better chance at retaliating. High Command is based in Privateer Press’s Iron Kingdoms, of which they have RPGs and miniatures games that have been around for quite some time, and have always been an example of top-notch creativity, artwork, design and enjoyment. This means they have a huge pool of amazing content to pull from, and they did just that! The cards hold up very well, but you might consider putting them in sleeves if you plan on playing this game a lot. Mainly because you’ll start with the same 12 basic resource cards every game, and those will constantly be getting shuffled. Also, your favorite detachments may get more worn over time since you don’t use all the cards each game. The box insert makes it really easy to construct your deck before each game. It is worth noting that we found out the hard way that the slots aren’t deep enough to keep the cards from falling out if you hold the closed box sideways. Not a deal-breaker by any means, but when transporting the game in the box, make sure and keep it flat. High Command is one of those games where you can teach someone the basics, and they’ll quickly get the hang of the rest while you play. This doesn’t mean the game is “light,” it just means that the core mechanics are easy to learn. If you want to quickly get the feel for the game, we highly recommend using the quick-start setup included in the rulebook. The ways the cards interact with each other may be a bit complicated for young children. If you’re a gaming family that enjoys deck building games and/or CCGs like Magic: The Gathering, this is definitely a game your family could enjoy together. There is definitely more player interaction in this game compared to other deck building games, but it’s not a party game. Strategy gamers will enjoy the depth of tactics and the importance of choosing your actions while anticipating what your opponents will do. If you’re a strategy gamer but have been avoiding deck builders, don’t let this game pass you by. High Command is easy to get into, and makes it fun to explore its strategies and tactics. It is also a wonderful way to delve into Privateer Press’s world of the Iron Kingdoms if you’re not into miniatures games or RPGs. Replayability is huge in High Command. You get four factions, each with their own play-style and sets of cards to customize each game with. Even with all its depth, it is easy to teach and fun to play. If you enjoy Warmachine, Hordes or the Iron Kingdoms RPG, this is a must own. It will allow you to play your favorite miniatures faction with your more casual friends and family. If you’re new to Warmachine, High Command is still worth looking into because it is highly strategic for a game with deck building mechanics. High Command hits the mark of a great game on so many levels. Everyone we played with, after their first game, instantly wanted to check out the detachment decks for their faction that they didn’t use and play another round. I’ve never seen a game that made deck construction so intriguing and fun for such a variety of gamer types. I think because it’s so easy to do the first time someone plays, it makes deck construction a welcome part of the game, rather than an intimidating one. Yes there are cards, and drawing every turn, but Privateer Press has done an excellent job of eliminating the amount of luck that is involved. You always have four cards in your reserves that you can purchase from, and there are ways to refresh one or more of those cards if you’re not seeing what you want. In High Command what you do on your turn actually matters with respect to the other players in the game. Do you stall them from capturing locations? Do you let them have a location but put a strong force on another location? etc. One concern I had was that each turn the first player draws from the Winds of War deck which has an effect that lasts until their next turn. At first it felt like at times it was an advantage to be the first player, but then we realized that once you get towards the last five cards in the Winds of War deck it’s no longer an advantage. This is because the first player can’t do anything once they draw the end of game card, so the other players can turn things to their favor when they anticipate the game will end. But even that is balanced by the fact that you don’t know exactly when the game will end. Overall, we enjoyed the variation the Winds of War cards provided for each round, and the way they made the end of the game a bit unpredictable. We really enjoyed the fact that your destroyed army cards are discarded, giving you the chance to draw and use them later in the game. It made the epic battles much more enjoyable if you were on the losing side. This also made the game much more fun for gamers who aren’t big fans of games that involve battles and fighting. Speaking of losing, I typically lose a lot, and this game was fun every time. You feel like you’ve got a shot from start to finish, and there are plenty of mini triumphs throughout the game, so even if you lose in the end, you still had a great time! You get four factions from Warmachine. For a little comparison, if you bought the Warmachine miniature for each warcaster, character, warjack and support unit in High Command you’d be spending thousands! Plus, you don’t have to assemble, pin, glue, gap-fill or paint anything, you’ve got professional art on every card! Another reason it is a must have is because High Command finally lets you play a game based on the Iron Kingdoms with more casual players. Maybe you can’t pull out and teach your spouse, family or buddy to play the Warmachine miniatures game or Iron Kingdoms RPG, but you could definitely pull out High Command and have a great time. Also, it is a great game to pull out at the game store if you’ve got down time between your miniatures games. Are you more of a fantasy fan? Or just want more High Command? If all this sounds great, but you’re more a fan of fantasy, Privateer Press has you covered with Hordes: High Command. With Hordes, rather than warjacks you’ll have warbeasts, and rather than warcasters you’ll have warlocks… the variety of factions will scratch any fantasy itch you might have. It’s a stand-alone game, but also completely compatible with Warmachine: High Command. We’ve played both on their own as well as combined together and had a blast! Owning both is highly recommended as it will double the already high amount of replay value! We couldn’t say it better than we did at the start… If you’ve been looking for a deck builder with more strategy, awesome source material, and tons of replay value… High Command is it! This stand-alone game can be played with just the contents of this box or combined with other Hordes and Warmachine High Command products for a customizable experience. The fires of continent-spanning war engulf western Immoren, forging great leaders in a crucible of conflict. Bold commanders orchestrate grand strategies and daring battlefield tactics, their actions bringing glorious victory—or the despair of final defeat. Do you have the courage and cunning to lead your forces to ultimate triumph? Take command and muster the military might of an entire nation to conquer the Iron Kingdoms! Warmachine: High Command is a deck-building card game for 2-4 players set in the steam-powered fantasy world of the Iron Kingdoms. Leverage your resources, rally your armies, and dominate your foes to set your banner above all of western Immoren! Privateer Press previews High Command, a game of strategic deck-building conquest in the Iron Kingdoms. WARMACHINE: High Command and HORDES: High Command release Fall 2013. 1. The artwork is fantastic. I can understand the issue with people with color blindness though. 2. The rule book is easy to read and understand, and relatively short, which makes jumping in much easier. 3. While the rule book is good, the game overall is lacking. My wife and I played two player and I just felt like the game progressed very slowly. Combat actions were clunky and something seems to be missing from the game overall. Hopefully Privateer Press will fix these issues with later releases and FAG/Rules updates. Overall, with the release of upcoming small expansions (and hopefully some larger ones) this game has lots of room to grow in to something fantastic. I would recommend getting it. Warmachine High Command is a new deck building game from Privateer Press that actually manages to emulate the feel of playing the Miniature wargame in card form. As a deck builder, High Command has a bit more complexity than a Dominion or Ascension. Initial game set up requires some additional effort from most deck builders. Each player/faction draws from their own customized decks building up better resources and war assets. The big difference is when you deploy your assets to capture locations from a shared pool in the center, pitting your warjacks and warriors head to head against your opponents. In addition, the winds of war are ever shifting and can change buying or battling conditions each turn in unexpected ways. Each faction manages to maintain its own unique feel and play style, and your choice of Warcasters and accompanying attatchment decks further hone and customize the experience. Incredibly repayable and tactically deep, High Command is a fantastic new way to enjoy Warmachine, both for fans of the original and deck building players alike! 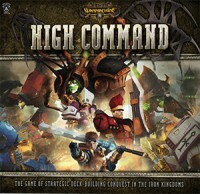 Add a Review for "Warmachine: High Command"